Putting together the final tweaks for ….the first book in Story Bird Dance series. 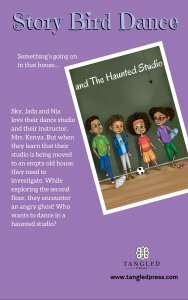 Something’s going on in that house… Sky, Jada and Nia love their dance studio and their instructor, Ms. Kenya. But when they learn that their studio is being moved to an empty old house, their excitement turns to dread. While exploring the house’s second floor, they encounter a ghost! They have to get rid of the ghost before the other students find out it exist. Who’d want to dance in a haunted studio?